On today’s show you’ll meet the CEO of a fantastic initiative whose vision is to make outdoor play in nature an everyday part of childhood. Sarah Sutter heads up the not-for-profit organisation, Nature Play SA. In a short period of time, childhood has evolved into something most of us wouldn’t recognise. If we pause, our own experience of childhood is likely to look very different to that of our children. A number of societal changes have combined to brew the perfect storm. We lead busy ... See More lives. As working parents, we look to structured activities and new technologies to help us manage our time. Backyards have been reduced to courtyards and there’s a growing fear for our children’s safety. While it may feel like we’re making gains, what we’ve lost is the space to play. To create, imagine and be bored. To spend time in nature, engaging all of our senses, socialise and, most importantly, learn. Current research is telling us that our children are not as happy, healthy or emotionally resilient as they once were. 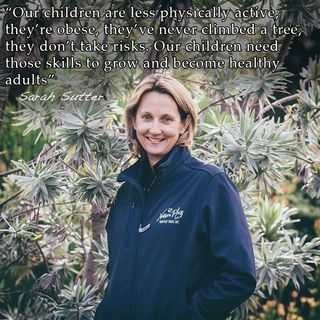 Join me as I chat to Sarah about how Nature Play SA are working to empower parents, educators and the broader community to bring the essential elements of childhood back into our lives.